These tokens can be used to replace the Mortem et Gloriam (MeG) cards. 50 2mm thick 25mm round tokens with etched design on one side. 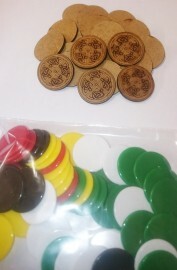 The tokens require making up, all you need to do is glue the tidily wink counters to the blank side of the token. We recommend a glue such as UHU all purpose clear adhesive.